Patriot League play resumed for the Boston University men’s soccer team on Saturday evening, as BU (6-7-2, 5-1 Patriot League) celebrated its ten seniors for Senior Day and came away with a win at Nickerson Field against the United States Naval Academy. The Terriers pulled out a 1-0 victory against the Midshipmen (2-10-2, 0-4-2 Patriot League) and is now tied for first place in the Patriot League with only three conference games remaining to be played in the 2017 season. 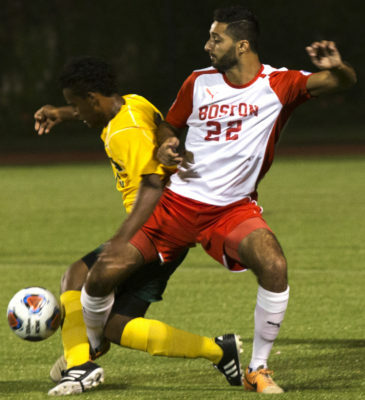 BU improved its home record to an even 50 percent, and continued its run in conference play with a fifth shutout victory. Starting more seniors than usual, the Terriers came out with an impressive amount of ball control and possession. The first 22 minutes showed the Terriers mainly working up the sidelines to try and find scoring opportunities. BU managed to find four shots and three corner kicks and the continued pressure eventually led to an opportunity, but was put away. In the 24th minute, freshman midfielder Toti Knutsson flew down the right side of the box to the six-yard line to head home a lofted cross assist from fellow freshman back Maxwell Aunger, beating Navy’s senior goalkeeper and reigning Patriot League Goalkeeper of the Week Mac Burke. After the breakthrough from the Terriers, the Midshipmen came back with a bit more energy than they had started with. However, BU soon continued to dominate the possession of the ball. By the end of the half, the Terriers had a 1-0 lead after getting 10 shots and four corner kicks while holding Navy to just one shot. The second half opened up with continued pressure from the BU side, but Navy found some opportunities. Within the first 15 minutes, the Midshipmen were able to find two shots that each tested sophomore goalkeeper Michael Bernardi. Later in the second half, BU started to gain control again. By the 77th minute, BU had twelve shots and six corner kicks, while holding down Navy’s attempts to six shots and one corner. As the final 10 minutes of the game came around, the Midshipmen resumed their offensive onslaughts, and the Terriers started to tuck into a more passive style of play. It seemed as though switching sides for the second half allowed Navy to even the playing field, however, Roberts was pleased to see his team stick it out for the win.